A growing collection of drawings of mice with human characteristics. 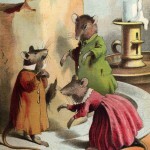 These mice graphics include mice in dresses and other clothing where they are presented more like characters in a story than animals. These anthropomorphic images would make a fun and whimsical addition to your next creative project. 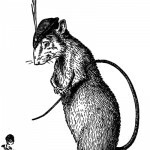 Anthropomorphic rat drawing of a rat wearing a hat. Charming drawing of a pair of mice, all dressed to go out, invite a shy friend to join them. 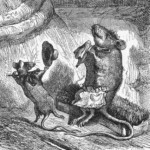 Anthropomorphic drawing of a mouse entertaining his mother. 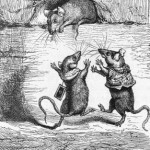 Three mice admire a large unattended piece of cheese in this great vintage drawing of mice as people.